As we drive along the east side of the Sierra (Hwy 395), we’ll make a couple of restroom and snack stops along the way. We enter the park at Tioga pass. Once arriving to the Valley, we’ll make multiple stops: Tunnel View, Bridalveil Falls, Half Dome Vista, Yosemite Falls, Valley View – El Capitan. 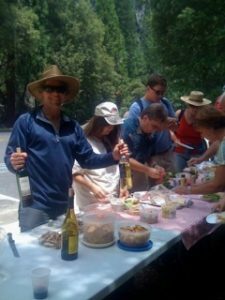 Picnic lunch with drinks will be served in Yosemite Valley. Before driving home, we make a stop in Lee Vining at the small restaurant/convenience store, The Whoa Nellie Deli where you can have a snack, soup, salad, sandwich and much more. From there, it takes 1 1/2 hour to get back to Tahoe. 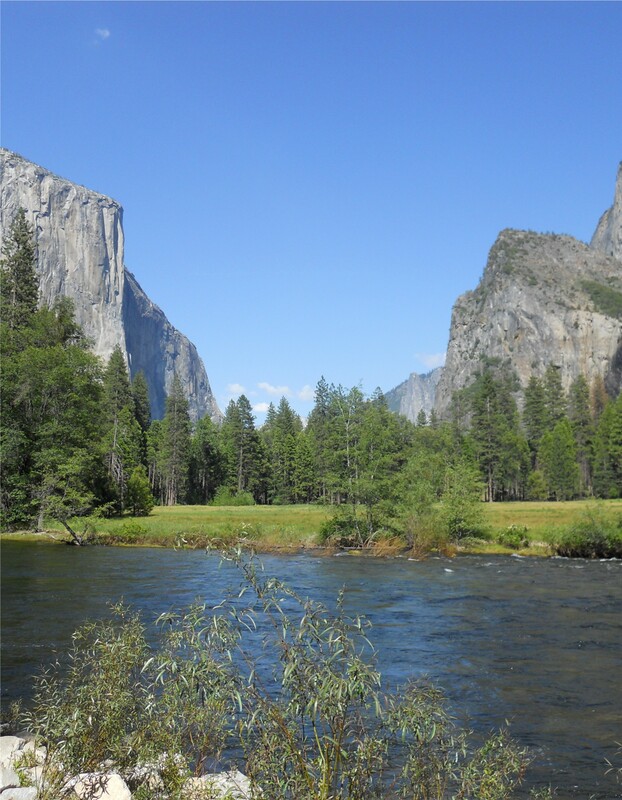 Detailed description of this tour: The Yosemite tour is an in depth, full day, multimedia, documentary tour with a blend of narration, short films, and music to go along with the outstanding scenery throughout the bus trip to Yosemite Valley. The tour adjusts to the seasonal conditions so it switches focus from waterfalls in spring and early summer to cliffs, climbers, and big trees in late summer and fall. There are still waterfalls flowing at slower flows from August through October such as Bridalveil Falls, Cascade Falls, and Wildcat Falls. The tour does highlight these falls regardless of the season. Pick up for the tour begins as early as 5:30am and makes the first stop in Walker on Hwy 395 which is 1 hour into the trip depending where the pick ups are. 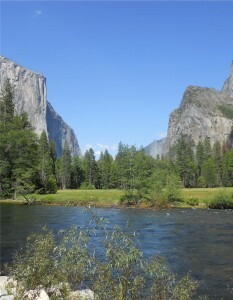 A short preview film of Yosemite is shown during this section of the trip. The next stop is at Whoa Nellie Deli for restrooms and snacks. 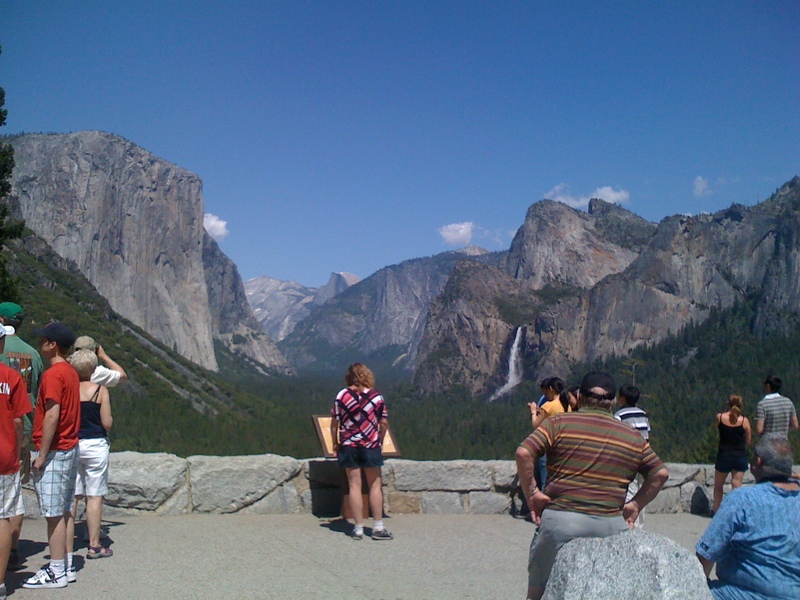 Next, we’ll drive up Highway 120 to Yosemite’s Eastern gate at Tioga pass and highest point on the tour. It’s also one of the grandest entrances to any national park. The tour reaches the gate by 9am. Another photo and restroom stop takes place in Tuolumne Meadows or Tenaya Lake depending on congestion and season. 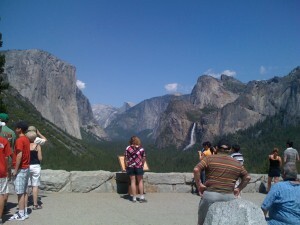 Half an hour drive from Crane Flat is Yosemite Valley. Bus goes straight to the Cascade and Wildcat Falls picnic area 2 miles downstream from the valley. We will stop for lunch at the picnic grounds near Cascade Falls, among the Live Oaks and Ponderosa Pines, and large cliffs. This picnic area has tables, restrooms, and trash disposal. 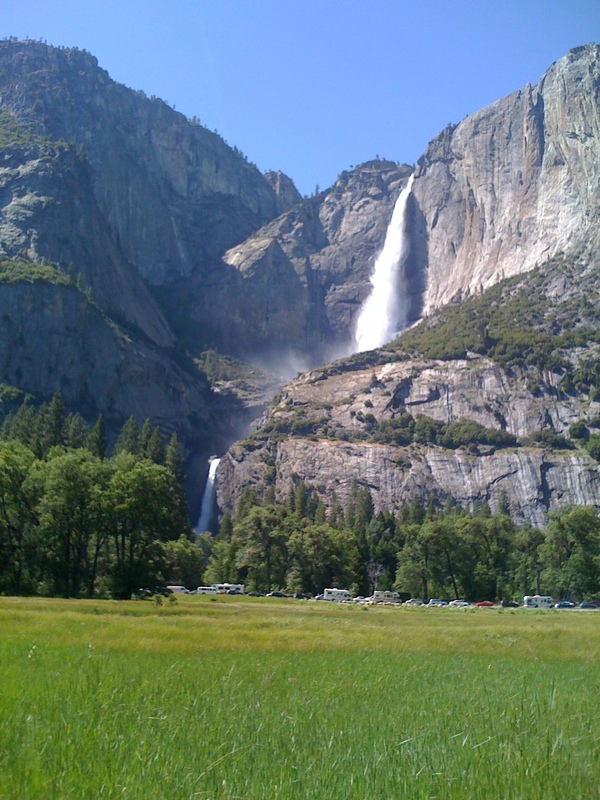 After lunch is the tour of Yosemite Valley with various views including Bridalveil Falls, El Capitan, Cathedral Rocks, Sentinel Rock, Half Dome, Yosemite Falls (spring to mid summer), Sentinel Falls (spring to mid summer), Three Brothers Cliffs, and Glacier Point. Photo stops are part of the experience on this trip. The final stop in the valley is the Valley View along the Merced River which provides panoramic views from Bridalveil Falls to El Capitan. This is one of the signature views of the valley. The tour continues back toward the high country where it started with a one of a kind stop at Olmsted Point to see Cloud’s Rest, Half Dome, and Tenaya Canyon to the West and the Sierra Crest to the East. The views along Tioga Pass Road change throughout the day according to where the sun is so the tour makes more stops there in the afternoon than in the morning. Various stops are made according to season and congestion along the way to the entrance gate at Tioga Pass. At the gate are final photos and a chance to get the Yosemite stamp (if you have a parks passport). The tour leaves Yosemite approximately 4pm and stops in Lee Vining after a scenic drive down the East side of the Sierra. The Whoa Nellie Deli and gift shop provide a nice place to relax, sample great food, and freshen up before the drive back to Tahoe.